We've read through your ghost stories and picked out ten of our favorites. 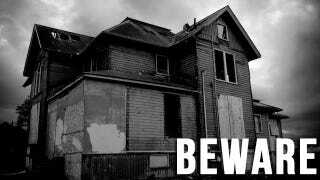 Read on for tales of creepy photos, scary basements, a haunted daycare center, and one very, very unwelcome visitor. When I was a kid, my best friend and I were looking at old photos in his house. There was one of a family wedding, a group shot outside our local church. One of the men in the photo had no legs. Not like, was in a wheelchair or anything, but literally in the photo, his legs just stopped at the knee and you could see the huge old slabs of the church — they even matched perfectly with the slabs that were on either side. It was exactly the same as if you were looking at a photo and looked at the wall above his head, rather than below his knees. Now, I can't blame digital trickery as this photo was WAY too old for that (70s, maybe?). Maybe someone with a working knowledge of photography could explain it. The weird thing is that the guy in the photo (my friend's uncle) ended up with diabetes and had both legs amputated at the knee years later. I was 7, my brother 10, my mom in her early 40s, my grandmother (her mom) in her 60's. So we were all cogent. No one was too young or too senile to not recall this nonsense. Yet, still no bloody answer. Grandma lived on an isolated country road in NC that was named after her family since they were the only crazy fuckers who lived on the land for about 1000 acres. And I *do* mean crazy. We have stories about relatives that start with, "You remember that time Uncle Bob was in the ditch with a shotgun?" "WHICH TIME?!" Her house had been empty for several weeks while she'd been visiting us in Florida, but we were all back, spending the weekend with her before trekking back to the Sunshine state. The house is in the foreal country, literally over train-tracks, past a salvage yard and her nearest neighbor (a cousin — everyone is related to everyone who owns a house on the road) ain't within screamin' distance. Yes, that seems to be a real system of measurement — "screaming distance." It's early in the AM, like just before daybreak. We're awake because these are farm freaks who wake at the crack of dawn from sheer ingrained habit. We're eating cereal when we hear someone pull up outside. Curious, we all run to the big picture window that looks onto the front yard. There is a strange truck there. No one seems to be behind the wheel, though the engine is idling. The truck is... well, old, for one thing. It's old-timey like from maybe the 1930's? You could picture the Joad Family heading to California in this thing. It's rusted but it was probably once painted blue. We stare at the thing, bewildered. Mom asks grandma if she knows who that is. Nope, not a clue, says grandma. She runs to get the phone to call her cousin and ask him to come up — she thinks maybe it's a hired hand and he's just at the wrong farm. Just as she asks him to come on down, the phone goes dead. Well, that's unsettling. All at once, there is a loud, insistent banging on the front door. We all scream. My grandma, who is terrifyingly resourceful, huddles us all into the living room, away from a window where anyone can see us. Then, while mom, me and my brother tremble there on the couch, she grabs a serrated bread knife from the kitchen and cautiously approaches the front door. She peeks out a side window, very stealthily. She turns back to us and looks confused. She shakes her head, like, "No one is there." We all kind of breathe easier. Then EVERY goddamn door in the house is banging — relentlessly. I can still hear it. Rhythmic and terrifying, like all the doors are about to splinter and crack. There were two doors in the basement beneath us, so the sound is also a reverberation at our feet. The three ground-floor doors are shaking — we can see them trembling and jerking on their hinges from our vantage point on the couch. Finally, mom runs to the window — either from a psychotic break with reality or terror, I have no clue. She cries, "Oh thank Christ — Cousin is here!" We run to her and peek out the picture window — there is no one that we can see in the yard, but we can't see all the doors from our viewpoint. My grandmother flings open the kitchen door as she sees him coming. He shouts, "Everyone get behind the couch! Get DOWN!" He runs past us as we bolt for the couch. The banging starts AGAIN, all the doors and now we can hear the windows rattle. It's like a tornado or the end of the world. We are too scared to even scream. Cousin flings open the front door and fires the huge shotgun, once, BANG, deafening. As he does, the truck roars into life and it sounds like a train. We scramble up; the banging stops, mercifully. Cousin is advancing onto the lawn, gun leveled at the truck. We run behind him, wanting to be out of that shaking, quivering house and near the dude with the gun. The truck peals out, backwards, cutting across the yard and racing into a breakneck speed. Tires sqeal, rubber is burned. Cousin fires again and we all cower behind him. He blows out the back window with the sound of a thousand plates smashing into linoleum but the truck never even hiccups, just roars down the road. No tags, not even a vanity plate on the back. The police were called. The phone line had been cut. There was not a single boot print in the entire yard except Cousin's, from where he'd run into and out of the house. Cousin reported that there had been no plate but when he looked into the cab, it looked like "something from a horror movie." He said there were all kinds of weird restraints — handcuffs, c-clamps, nylon straps — and he said the floorboards looked covered in what "smelled like" blood to him (Cousin was famous for his keen sense of smell and the window was down, so it's possible). Cousin said he thought he saw a blur of something out the picture window and ran to fire the first shot, but "missed" because, once he stood there, nothing or no one was on the lawn or in the truck. Then it shot backwards out of the yard and out of our lives, leaving no answers, just a deep sense of unease every time we'd visit. Grandma and Cousin have passed. Deeply religious people, they stuck by their unchanging versions of the story until they died. My brother, mother and I have never been able to figure it out — neither did the cops, I think it should be noted. We don't know how all the windows and doors were banging, and we don't know why we never saw a SOUL anywhere or how they could get around the sides of the house without leaving a trace in the damp earth. And just in case you want to get to sleep tonight, here's one with an explanation — though it's still pretty creepy. So, as a little girl, my friends' mother used to talk about this nice old lady who used to sit on her bed and stroke her hair as she fell asleep. Now, the parents thought she was just imagining it, and other relatives called 'ghost' — but on the whole they just put it down to the overactive imagination of a little kid. THEN — one day, their housekeeper sees a woman coming out of the little girls' bedroom. So she runs after her and grabs this real-life woman, who is in her 80's and very confused. Turns OUT that this woman used to live in the house and moved nearby, but since they didn't change the locks when they moved in, she kept letting herself into the house at night and gently petting my friends' mum as she fell asleep!